In separate shallow bowls, place cracker crumbs and flour. In another shallow bowl, beat egg and mustard-mayonnaise spread. Dip chicken in flour and then in egg mixture; coat with cracker crumbs. Place on cookie sheet or plate; let stand 5 minutes. In deep fryer or 6-quart Dutch oven, heat 1 1/4 inches oil to 375°F. Fry chicken in hot oil about 3 minutes, turning once, until chicken is no longer pink in center. Drain on paper towels. In small bowl, mix ranch dressing and pepper sauce. 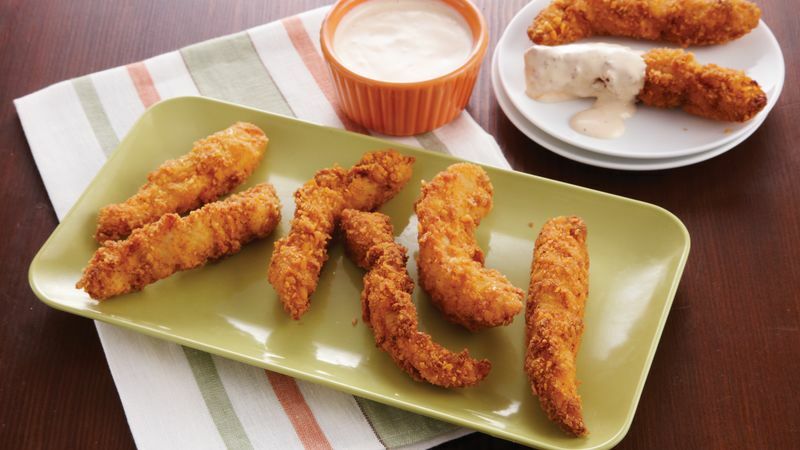 Serve chicken fingers with sauce for dipping.